(Newser) – Roller-coaster riders at one of Beijing's major amusement parks were left hanging upside down for almost 20 minutes when a bird stood on one of the ride's safety sensors. The Happy Valley Amusement Park said it took 18 minutes to bring the 26 riders to safety via a maintenance channel on Saturday afternoon, reports the Beijinger. Not scary enough? The site notes that passengers were stranded near the ride's peak height—nearly 100 feet in the air. No one was injured, though there were unsurprising reports of nausea, dizziness, and shock. 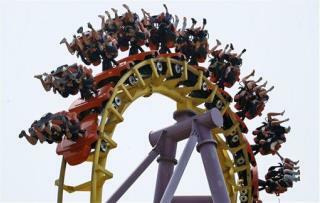 The roller coaster was back in operation later in the day, reports the AP. Hopefully nothing happened to the bird. :D they got there monies worth. OMG Really? Stopped because a bird was on one of the rails? Give me a pellet rifle ppffffhhiittt and ride continues in a few minutes..